When a series of crucial Gravity Generators that are keeping Earth’s Artificial Gravity shut down,a single mom must team up with two young science prodigies to restore power to the generators and save the entire world from the brink of destruction. Mission 51 is in production! On June 28, 2017, Mission 51 finished in the top 3 of the Nerdist Sci-Fi Contest, out of 173 entries, winning a full publishing contract on Inkshares. It is currently in editing/production. 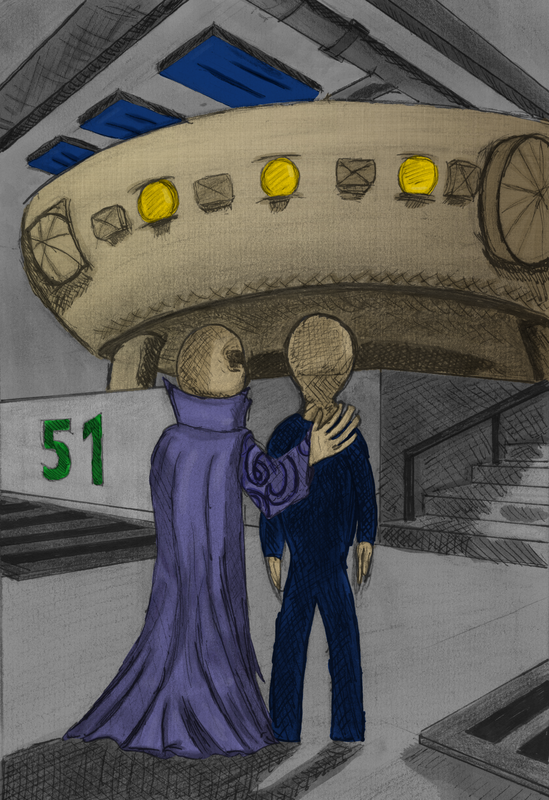 In Mission 51 I tell the story of Zeemat, the alien who landed in the American desert southwest in 1954, a place we now call Area 51. The story starts on Zeemat’s fascinating home planet where we learn about his people and their multiple attempted missions to the faraway planet they know as “Cerulea.” As part of Mission 51, Zeemat and his fellow crew members embark on an exciting and tragic 50 light-year voyage from their home planet to Cerulea, a trip that takes hundreds of Earth years. Zeemat reaches his destination in a dramatic crash landing as the sole survivor. We then learn that Cerulea is, in fact, the planet Earth, and Zeemat arrived in the post-WW II, Cold War era of the USA in 1954. Zeemat is the ultimate outsider, a stranger in a strange land doing his best to survive and to fit in. He has hopes, dreams, desires, and a mission. He has a lot to give and he also wants his piece of the American pie. This is his new home after all. At its core, this is an immigrant story that is out of this world. Zeemat’s story may be unique, but it parallels the immigrant experience many of us have lived. He survives, with a little help from his friends. For better and for worse, he lives to carry out his mission in his own way. This original drawing by Chris Pyke depicts Yonek revealing the ship Janusia to his son, Zeemat. The following are comments about this book, from the Formal Feedback Notes of The Tracking Board’s 2016 Launch Pad Manuscript Competition. "This project feels like it has strong potential for either a TV or feature adaptation, and stands on its own as a great read as a manuscript." Additional recommendations can be found in the "Reviews" section above. Chris Pyke - click to learn more! Idan Carré - click to learn more! Check out some of their work on the Mission 51 Pinterest board! I would love for you to join us on this trip! Please follow Mission 51 by clicking the "Follow" link at the top of this page. Also, to keep informed of important developments, please take a moment to sign up to my Ferd Crôtte - Author email list. I promise I will never share your contact information or flood your inbox with nuisance notes. Better yet, click the green "ORDER" button to reserve your copy. Mission 51 is currently "In Production" by Inkshares and will be available soon! Thank you very much for your interest. I welcome you to the awesome family of Mission 51!